One or more object elements that derive from the UIElement class. Object elements defined here become members of the Children collection. Grid Initializes a new instance of the Grid class. ColumnDefinitions Gets a ColumnDefinitionCollection defined on this instance of Grid. RowDefinitions Gets a RowDefinitionCollection defined on this instance of Grid. 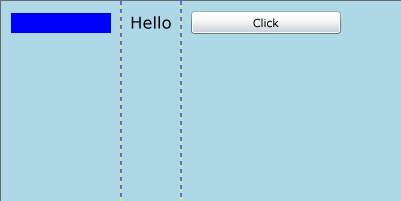 ShowGridLines Gets or sets a value that indicates whether grid lines are visible within this Grid. Column Gets or sets a value that indicates which column child content within a Grid should appear in. ColumnSpan Gets or sets a value that indicates the total number of columns that child content spans within a Grid. Row Gets or sets a value that indicates which row child content within a Grid should appear in. RowSpan Gets or sets a value that indicates the total number of rows that child content spans within a Grid. GetColumn Gets the value of the Grid.Column attached property from the specified FrameworkElement. GetColumnSpan Gets the value of the Grid.ColumnSpan attached property from the specified FrameworkElement. GetRow Gets the value of the Grid.Row attached property from the specified FrameworkElement. GetRowSpan Gets the value of the Grid.RowSpan attached property from the specified FrameworkElement. SetColumn Sets the value of the Grid.Column attached property to the specified FrameworkElement. SetColumnSpan Sets the value of the Grid.ColumnSpan attached property to the specified FrameworkElement. SetRow Sets the value of the Grid.Row attached property to the specified FrameworkElement. SetRowSpan Sets the value of the Grid.RowSpan attached property to the specified FrameworkElement. ColumnProperty Identifies the Column dependency property. ColumnSpanProperty Identifies the ColumnSpan dependency property. RowProperty Identifies the Row dependency property. RowSpanProperty Identifies the RowSpan dependency property. ShowGridLinesProperty Identifies the ShowGridLines dependency property. Grid is one of the Panel elements that enable complex layout. By default, a Grid contains one row and one column. To define multiple rows and columns use the ColumnDefinitions and RowDefinitions collections. Each RowDefinition and ColumnDefinition object inside the RowDefinitions and ColumnDefinitions collections define a single row or column. The RowDefinition and ColumnDefinition objects also define the size of each row and column using the GridLength object. For a definition of each unit type, see GridUnitType. 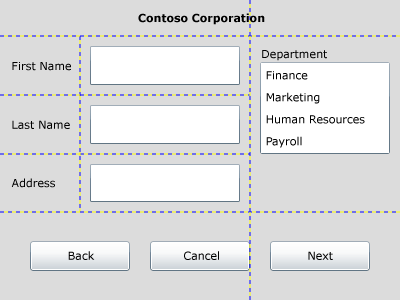 Grid is designed to use for layout of your application's user interface. It is not intended for data display. For displaying and binding to sets of data, use DataGrid. You can position objects in specific cells of the Grid by using the Grid.Column and Grid.Row attached properties. Columns and rows can take advantage of Star sizing to distribute remaining space proportionally. When Star is selected as the height or width of a row or column, that column or row receives a weighted proportion of the remaining available space. Star sizing is the default behavior. The following illustration shows a grid where the height of the first two rows is set to * and the last row is 2*. Columns and rows can use Auto sizing to distribute space evenly based on the size of the content that is within a column or row. The following illustration shows 3 columns using Auto sizing. Content can span across multiple rows and columns using the RowSpan and ColumnSpan attached properties. 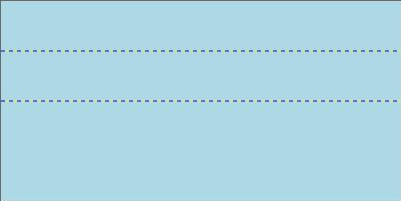 Setting the Margin property on the child elements in a grid sets the distance between the element and its grid cell boundaries. The HorizontalAlignment and VerticalAlignment properties describe how the child element should be positioned within the grid cell. You can precisely position child elements of a Grid by using a combination of the Margin property and alignment properties. Child elements of a Grid are drawn in the order in which they appear in markup or code. As a result, layered order (also known as z-order) can be achieved when elements share the same coordinates. For more information about z-order, see ZIndex. The following table summarizes the other available layout containers provided by Silverlight. Defines an area where you can explicitly position child elements by X and Y values. The following code example shows how to design a layout by using a Grid.